The only women’s razor with water-activated moisturizing serum – it hydrates skin like no other razor can. 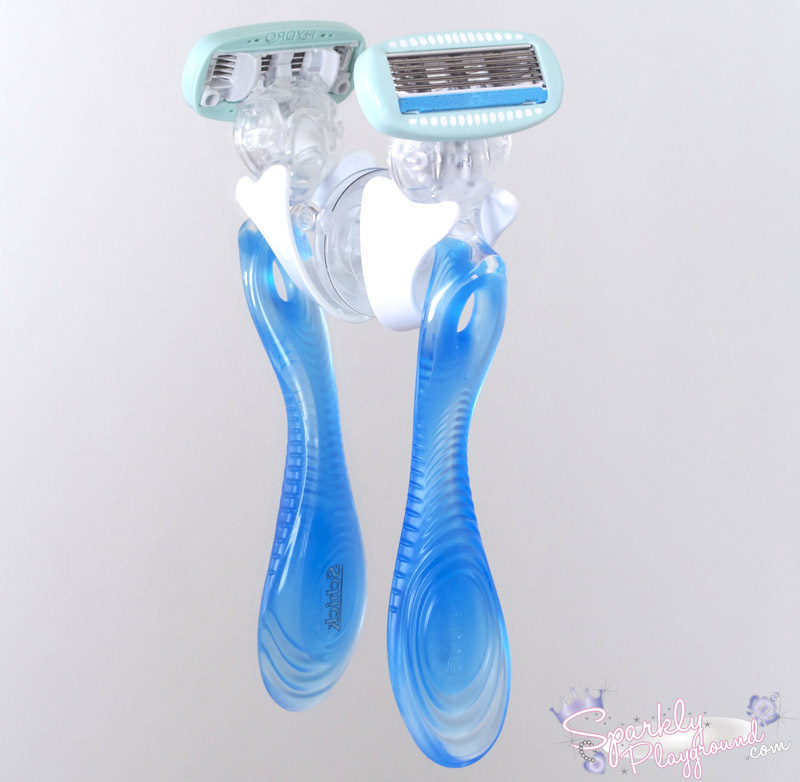 Plus, it has 5 Curve-Sensing Blades with unique Skin Guards that give you a super close shave while helping to protect your skin’s delicate surface. Moisturizing Serum – Hydrating water-activated Moisturizing Serum hydrates to replenish skin’s natural moisture throughout each shave and is infused with nourishing marine extracts and hydrating shea butter. Curve Sensing Blades – 5 Curve Sensing Blades deliver an incredibly close shave for silky smooth skin. Skin Guards – Skin Guards are added to each blade, doubling the points of contact between the blades and the skin. 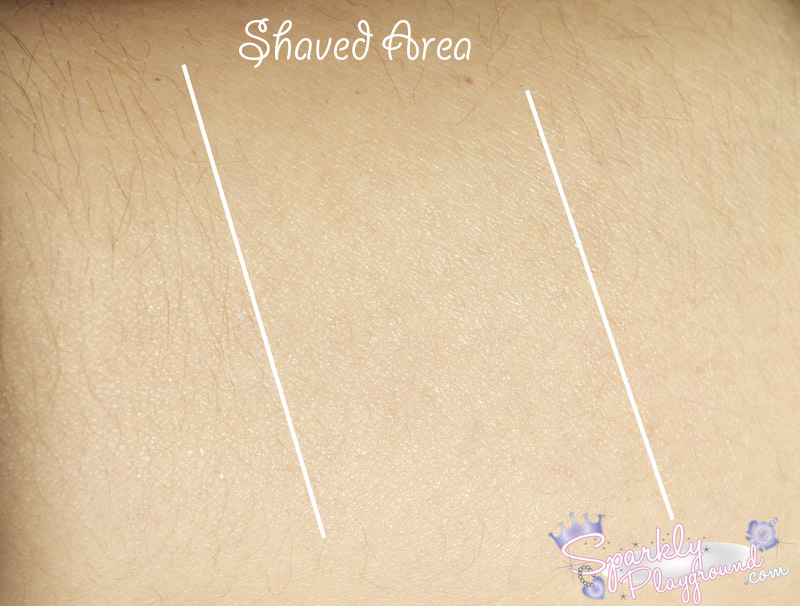 The Blades and Skin Guards work together to smooth your skin as you shave and to reduce irritation. Compact Oval Cartridge – The unique oval cartridge is designed exclusively for the contours and curves of a woman’s body, including those hard to reach places. Soft Touch Handle – Aqueous Soft Touch Handle is ergonomic by design with a soft rubber grip and is inspired by water for a beautiful look. The patent-pending duck bill feature enables the razor to be placed on a flat surface while holding the cartridge head away from that surface. Check out the photo above. It's the inside wrapper of the razor, a refill and the shower hanger. It provides great graphics, tips and how to use. I will explain how I used mine to experiment in my review below. It does come with a refill, so it's quite a good deal. One of these heads can last a really long time! OR.. you can win it here.. there's a giveaway below!! I'm going to be super hoenst with you, I'm definitely no razor specialist. I only used razors 2-3 times my entire life and was scarred for life (mentally). Due to razor burns, I've always been a wax/epilator person. HOWEVER, life is about trying new things and sometimes second chances. So, I was REALLY skeptical about reviewing this but I tried anyways. Ps, my boyfriend supervised me when I was doing this review to make sure I did it right HAHA He added some insights form his experience too! Pretty cool how this razor looks, I haven't held a razor in my hands for almost 10+ years, I guess times has evolved! This razor looks super chic with all the silicone cushions! Right at the razor blade area, there are white dots, those are actually Serum Beads! 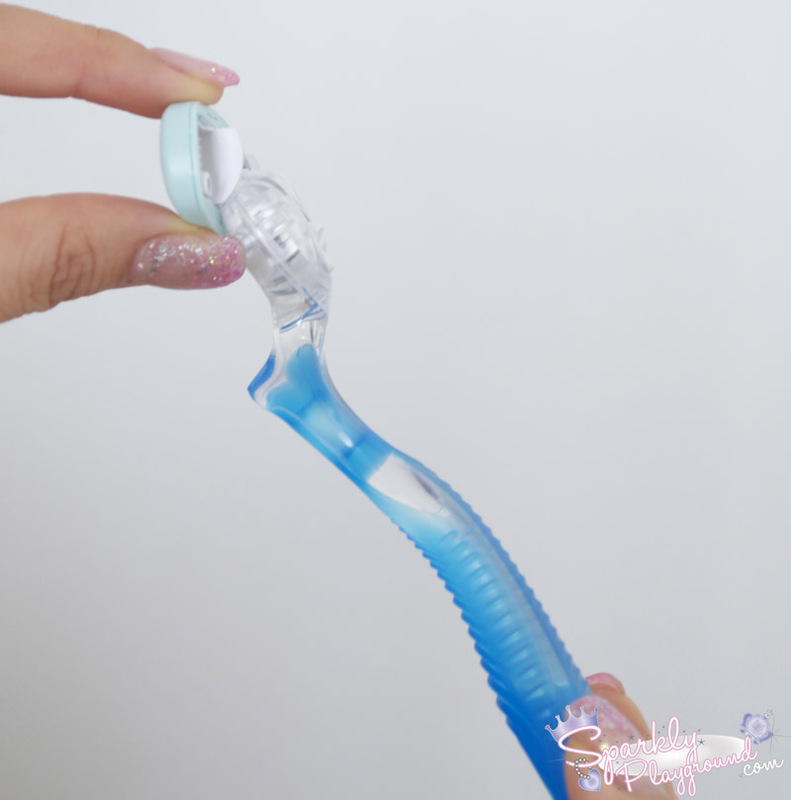 The razor package comes with a shower hanger, which is nicely convenient :) I do hope that it come with a cap though because of clumsy people like myself will surely get a cut no matter how careful I try to be. 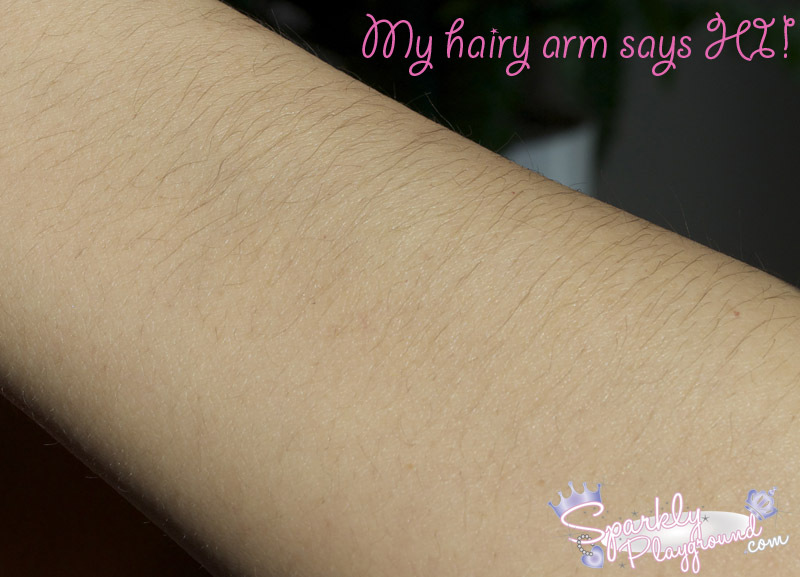 I don't know why but my arm has a lot more hair than my legs so, these will do! At first I was going to do it in the shower, but the indoor lighting really sucked and I was about to drop my camera into the tube so I had to re-plan the whole review situation! I took a bowl of water to show the demonstration inside of actually taking a shower! 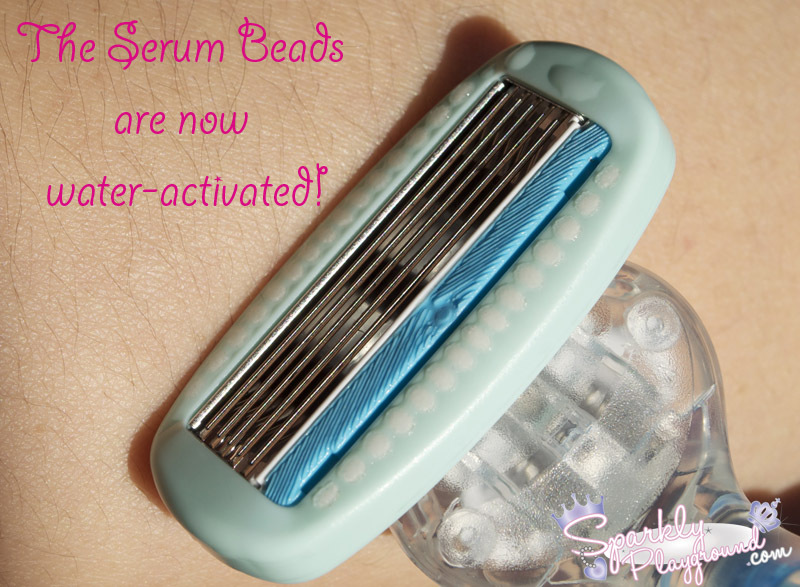 It is recommended that you do it on moistened skin, and also use water to wet the razor so that it can activate the serum beads! So in this case, I fully soaked the Schick Hydro Silk for about 5 seconds. 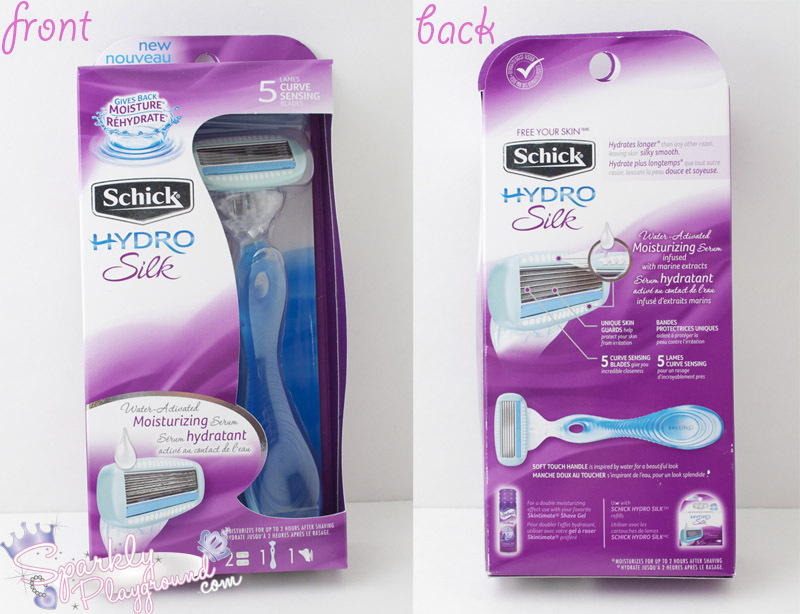 Schick Hydro Silk now water-activated! The Serum beads are now soaked and they basically inflated too! SOO COOL!! So now I applied it to my skin for the first shave. Notice how I didn't even use shaving gel?!?! Check out those shiny reflection too, that's actually the serum. It helps moisturize your skin right away! My boyfriend was quite fascinated. He was betting that I would get a razor burn if I shaved without any cream, foam or gel. I'm super amazed at this point. 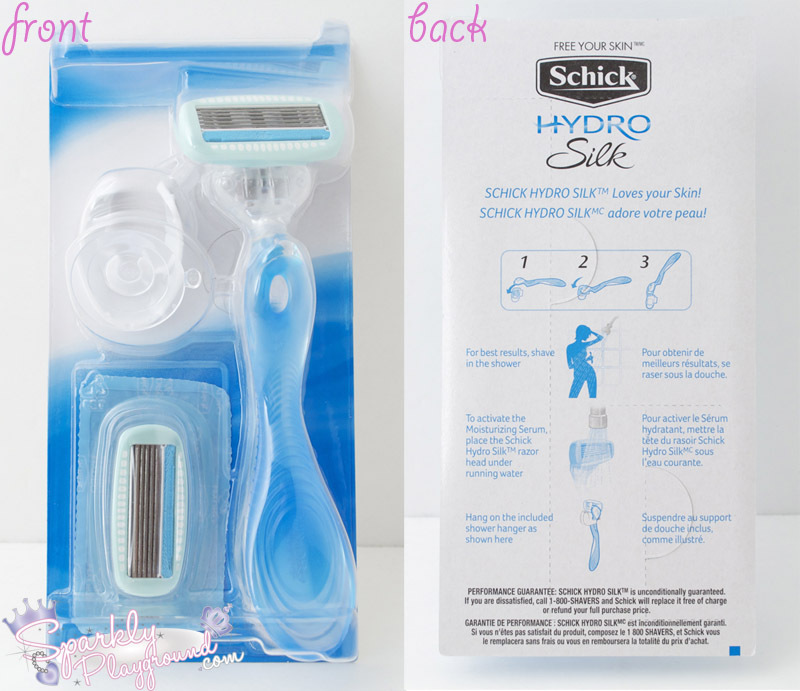 Schick Hydro Silk with just 1 stroke. 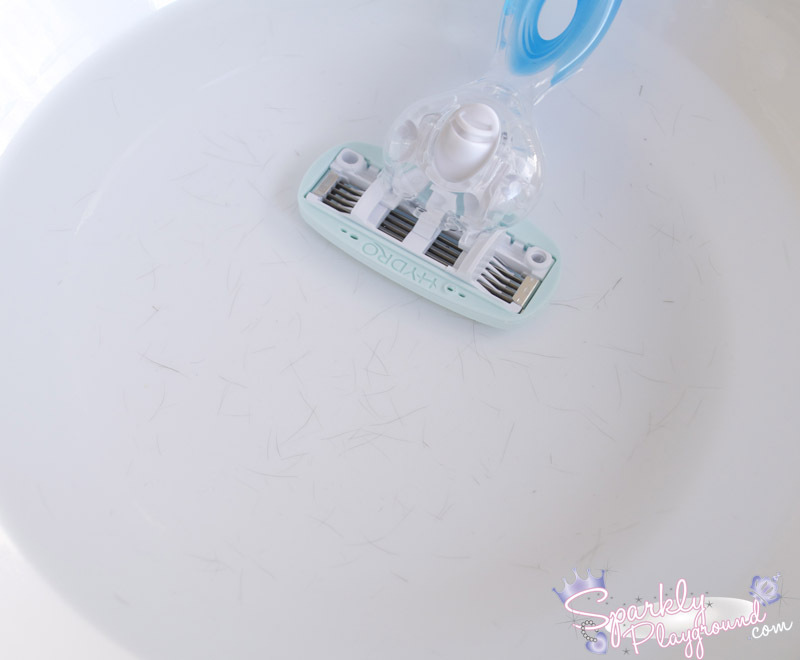 hahahaha, I soaked the razor head back into my bowl of water to see all the hairs that came out. gross. I really like the razor! It changed my thoughts about them forever! And for those who would like to be more moisturized, feel free to use your favourite shaving gel! I tried this on my bf and he thought it was really good too (note: his hair was a LOT thicker than mine, and he tried it on his neck area where it was super sensitive. No rashes. He recommends to use shaving gel next time though just because us girls have really delicate skin -- he pays attention to details!!) To take care of the razor, just hang it dry. 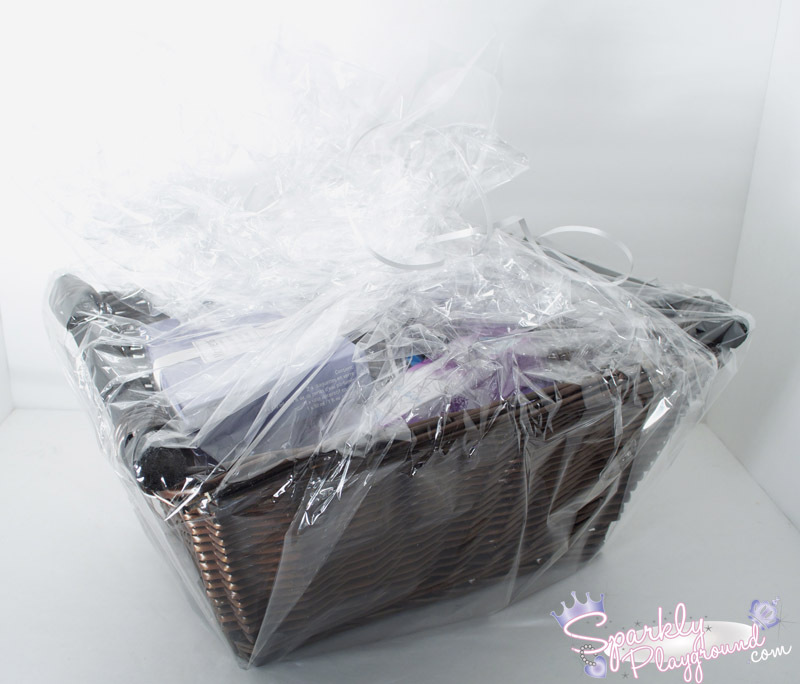 Schick Canada and Paradigm PR sent me a Schick Hydro Silk gift basket which includes a new Schick Hydro Silk razor, a lavender water bead fragrance diffuser and a variety of spa essentials (purple spa wrap, spa slippers, pedicure file, toe separators, nail brush, cuticle sticks and a nail file). 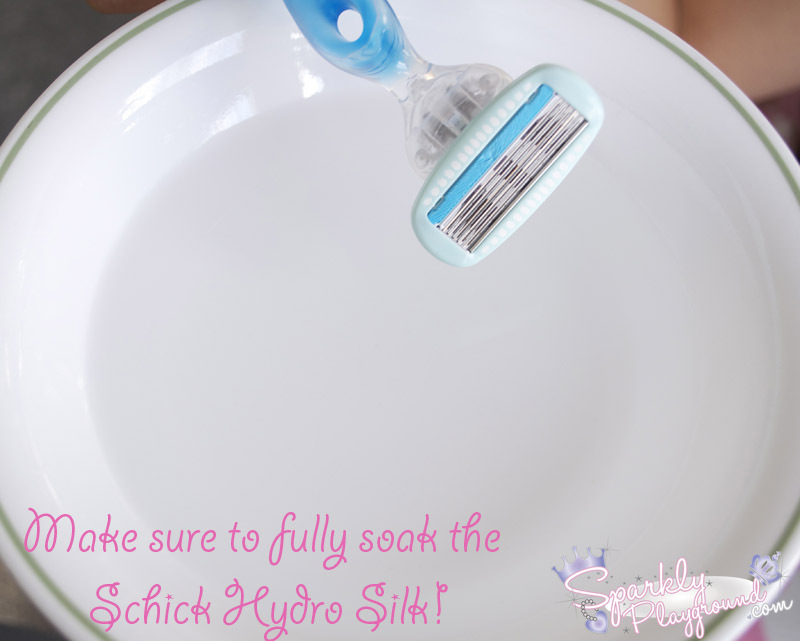 Do you want to try the Schick Hydro Silk first hand?!?! First 25 people to do the ALL of the following 3 requirements WILL WIN! 1) Follow SparklyPlayground.com using any method! 3) Comment on this blog post below telling me you have done all three in details. Like always, I will be checking. I will be reply your entry/comment by letting you know whether or not you have qualified. If you have qualified, then reply me with your email so I can ask for your Canadian address. If you have not, you can simply enter with a new entry until you have completely qualified. Remember, it is first come first win!! As I'm going through emails, replies and entries, there has been some entries which were disqualified because they were international residents (sorry guys). As of this moment, I have 6 confirmed addresses in hand that qualify. Keep entering :)!! Officially 13 Addresses on hand :) I think some people probably didn't check their emails yet. Anyway, like i said, it's first come first win! Keep entering! Thank You Everyone for entering! I have collected all 25 addresses! Those who are receiving the razors, you've all been notified personally from my email. I'm going to send them all off to the PR company so they can send you the razors! Thanks again everyone!